Dr Barnaby Fulton (Cary Grant) is the stereotype of the absent-minded scientist. They are going out to a dance party and Mrs Edwina Fulton (Ginger Rogers) has to remind him twice to put off the hall light, put on the porch light, and lock the front door while she gets the car ready. Both times, our man puts off the hall light, puts on the porch light, and then goes into the house and locks the front door. After watching him start to do it the third time, his long-suffering wife goes in after him and helps him remove his coat. It takes Barnaby some time to realise a) that his wife is all dressed up in a new outfit (that he compliments her on) and b) that they were supposed to be out at a party. He is properly apologetic, but Edwina brushes it off - she knows her husband is preoccupied with a new project, and tells him she will make some dinner while he thinks more about it. It is quite evident that Barnaby and Edwina are head over heels in love with each other. As he's eating, Barnaby ruefully remembers how, right after they were married, they bunked a dinner party and stayed home - for a different reason than they missed the party this night. Edwina reassures him that there will be plenty of other parties that they can stay home from. Right now, Barnaby is working on a formula that will reverse the ageing process - the fountain of youth, as Mr Oxly (Charles Coburn), Barnaby's boss calls it. Barnaby is not that sure - he is sure the formula needs more work. But as he burns his mouth on the hot soup that Edwina gives him, he gets a brainwave - perhaps heating the formula will do the trick? Next morning, he and his assistant Dr Linten get to work on a new batch of the formula B-4, now to be called X5-8 (the previous batch was called X5-7). They cool some part of the formula, heat up a little, add various chemicals from different beakers and finally have the new batch. Dr Fulton's antics are watched by a pair of inquisitive eyes - Esther, the 6-month chimpanzee who had managed to get out of her cage, and has been put back by Dr Fulton. When Dr Fulton and his assistant leave the lab to check something, Esther gets out of the cage again - Dr Fulton had forgotten to lock her in. She sits herself down on the lab bench, and mimicking Dr Fulton, merrily mixes chemicals from the beakers and pipettes and glass bottomed flasks. Then, deciding she doesn't quite like her concoction, she wanders over to the water cooler left invitingly open by the janitor who had gone to get a new bottle of water, and empties the beaker into it. When the janitor returns, he scolds her and puts her back into the cage, not guessing that the water cooler has been tampered with. When the scientists return, Dr Fulton, in the interests of science, decides to experiment with the formula on himself. It tastes horribly bitter, and he takes a drink of water from the water cooler to rid his mouth of the taste. However, the formula seems to have made even the water taste bitter. Or so Dr Fulton thinks. The results, a few minutes later, are shocking. The nearly-blind-without-his-glasses Barnaby Fulton suddenly realises that he has perfect vision. His bursitis has been cured, he can turn cartwheels, and he suddenly feels very young. Edwina calls up the laboratory asking him to get a hair cut, buy a new suit, and go check out a car that the dealer had called about. Barnaby proceeds to do all three - only, his haircut is a very close crop, his suit is a checked suit that is flashy and loud and definitely not suited to a scientist of his reputation. The biggest surprise, of course, is dealt to the dealer who, instead of selling Dr Fulton a sedate sedan as he had hoped to do, finds the good scientist driving off in a snazzy convertible. Meanwhile, Dr Linten has informed Mr Oxly that Dr Fulton has left the lab, and that he thinks the formula has worked - Dr Fulton was behaving like he was 20. Excited about the breakthrough, Mr Oxly sends his lovely but dumb secretary ('Anybody can type,' says Mr Oxly) Miss Lois Laurel (a divinely air-headed Marilyn Monroe) to get Dr Fulton back. Instead, when she runs into him at the car dealership, she is easily persuaded to go along for a drive in Dr Fulton's new convertible. By this time, the formula is wearing off and Barnaby cannot see without his glasses - his glasses are back at the lab - and he ends up crashing the car. He hands over the keys to Lois so she can park the car, and goes to snooze on the couch in his lab. Edwina, who has been informed of her husband's absence by Mr Oxly, comes there later in the evening, complete with dinner for her husband. Barnaby is more than happy to see her. He is so engrossed in telling her all about the success of the formula that when she asks him about the splotch of red on his cheeks, he happily tells her that it is lipstick. Oh? says Edwina. Whose? Oh, Oxly's air-headed secretary's. Edwina is quite scathing - that little pin-up girl? Barnaby, his attention only half on what Edwina is getting at, tells her that Lois is still a half-infant. Edwina, more up to the mark than he is, remarks, 'Not the half that is visible.' Barnaby summarily dismisses Lois as 'not his type'. He is more intent on replicating the experiment, with double the dose of the formula this time. Edwina, who despite her calmness, is not very keen on Barnaby running off to spend time with Lois again, decides she will be the one to experiment this time. After all, he is the scientist and should be observing the effects (and he couldn't have, previously). And so, Edwina hastily downs the measured dose, and because it is so bitter, washes it down with water - from the water cooler. Of course, we know what will happen next. Edwina gets all cheery, and playful, and even as Barnaby is explaining to Mr Oxly (who has been informed that Dr Fulton is back) that Edwina has volunteered to be the guinea pig, she quietly drops a goldfish from the lab aquarium down Mr Oxly's pants. Then, she compounds her mischief by placing a pie that she had brought as dessert for her husband on the chair just as Mr Oxly sits down. Barnaby, deciding that discretion is the better part of valour, takes her out of the lab, but not before Edwina decides that she needs to punch Lois (who has just arrived) and 'pull her blonde hair by its black roots', much to Lois' consternation. In the parking lot, Edwina is thrilled at their new car, and decides she wants to drive it all the way to La Jolla, where she and Barnaby had spent their honeymoon. She wants to go dancing there. And so they set off, Barnaby and Edwina, on a wild drive to a town 70 miles away. By the time they reach Pickwick Arms, the hotel they stayed in before, Barnaby is very tired, but Edwina wants to dance. (Well, it's Ginger Rogers - how can they not make her dance?!) So they dance, though Barnaby is falling asleep on the dance floor. Finally, they go up to Suite 304 - the Bridal Suite where they had stayed on their honeymoon, and Edwina is flirty and maudlin and querulous, by turns. One thing leads to another, and Edwina breaks Barnaby's glasses (a mistake) and locks him out of their room. Poor Barnaby is left to stumble through the hotel and finally ends up sleeping on a gurney in the laundry room. The next morning, when a contrite Edwina finds him, he is quite naturally upset. His irritation increases when they return home to find Edwina's mother accusing him of being a wife beater, and Hank, who's come to ostensibly help Edwina with a divorce. It turns out that amidst the previous night's hullabaloo, Edwina had phoned both her mother and Hank raving and ranting about Barnaby. She however manages to send Hank off, and shut her mother up and conciliate Barnaby, who is now sure that the formula is not worth all the trouble it brings in its wake. He decides to go to the lab at once to tear up his research notes. What will happen, he asks Edwina who has accompanied him, if you revert back to a 10-year-old when you drink the formula? Or five? Or even younger? A baby perhaps? They are both tired and sleepy and almost hungover by this time, so Edwina decides to make some coffee for both of them. Guess where she gets the water to make the coffee? Monkey Business is a farce. And slapstick. And has a wafer-thin plot. It is credited to three writers, Ben Hecht (Gone with the Wind, Mutiny on the Bounty, Some Like it Hot, Gunga Din), Charles Lederer (Gentlemen Prefer Blondes, Ocean's 11, I Love You Again), and I.A.L. Diamond (Love in the Afternoon, The Apartment, Irma La Douce, Kiss Me, Stupid). They give each of the three leads their own space to shine and dialogues that play to the strength of their characters. The deft direction, the fantastic one-liners, and the excellent leads take that fantastic screenplay and run with it. Cary Grant is fantastic at the subtle expressions and the purely physical comedy, and he does both here. His expression when faced with Marilyn Monroe's legs (she is showing off his last invention - a pair of stockings that will not tear or snag) is priceless. Marilyn Monroe is at her glamorous best, and plays the part of the dumb blonde with such perfection. (When Dr Fulton mentions that she is early to work for a change, Lois responds: "Mr. Oxly's been complaining about my punctuation, so I'm careful to get here before nine." That woman lit up the screen every time she appeared. Ginger Rogers was a revelation. I loved her Edwina, the mature wife, and her turn as the sassy, chirpy, high-schooler when she turns into a juvenile has to be seen to be believed. They are ably assisted by Charles Coburn and Hugh Marlowe, and Esther, the chimpanzee, plus a host of other secondary characters who are not credited. Howard Hawkes made some wonderful screwball comedies, and he and Grant have teamed up before (Bringing Up Baby, I Was A Mail War Bride, His Girl Friday). This is probably one of the last classic screwball comedies to come out of Hollywood. 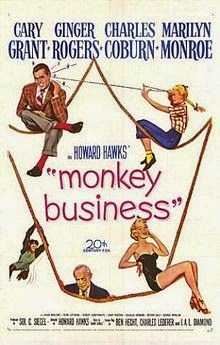 Monkey Business is one of those effortless films that will definitely chase your blues away. I defy you to watch it and not laugh. The long list of writers is interesting . . . maybe accounts for some of the madcap-gags that don't seem to fit together at first glance. A lot of cooks in the house, but if memory serves, they served up a pretty good dish nonetheless. Heh. This was one of the films I reviewed in the early days of my blog. My main reason for watching it was Cary Grant and Ginger Rogers, not so much Marilyn, but I must admit I liked Marilyn too - total airhead, and very pretty. Overall, loads of fun, though I did find some of those scenes when they've become 'young' a little OTT. Talking of Ginger Rogers not getting to dance, have you seen the Ronald Reagan-Ginger Rogers-Doris Day starrer, Storm Warning? Not at all the sort of film I'd have expected with Day and Rogers - it's about a KKK murder and the sudden flaring up of racial tension in a small town. Not a song or dance in sight. When I ordered this off Netflix, I didn't know it starred Marilyn as well. So she was a bonus. :) You are right about the scenes when they were young going a little OTT. I had a rather strained smile when the painting episodes came on. Hey, where did my comment disappear? When I posted it it showed up,but now it seems to have disappeared. I will come back later and post my comment again, you see I have a real time problem. Do not know Anu anyway I will comment again. OK here I go again, you see when I saw the updates in my mail box, and checked and found that you had reviewed a Cary Grant film, I knew I had to take time out to read every word of the review. I have been busy with personal matters, so much so that I was able to complete my own post with great difficulty. Before I continue, remember to tell us about your husband's ironing episode. HA! HA! I am curious. Back to my hero Cary Grant, I really do like him, I have vaguely heard about this film, reading your review I know this is a film I would enjoy. I do not mind slapstick comedy particularly when it has such a wonderful cast. Unfortunately it isn't available on You Tube, actually none of the good films are, however there are a few scenes maybe I will just see them, poor me! Thanks, Shilpi. I apologise for the inconvenience. your hands on it, it is well worth the two hours. Thanks for taking the time to comment again.